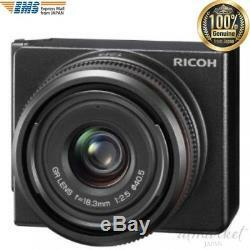 RICOH Camera unit for GXR GR LENS A12 28mm F2.5 170560 genuine from JAPAN NEW. Our products are 100% authentic. Unit replacement type camera GXR compatible F2.5 28 mm single focus lens 28mm single focus lens compatible with unit exchangeable camera GXR. You can enjoy photogenic expression with emphasis on quickness and perspective. Advanced Balance of Quick-shooting and Expression Power 28mm Single Focal Lens 28mm single focal lens that you can feel the pleasure of photograph expression as much as you take. Shooting style that gives priority to quick shooting, photogenic expression that emphasizes perspective and the ability to cope with both. Since the depth of field is deep, if you narrow it down, you can shoot with pan focus. The pleasant feeling when the shutter is released at the moment of holding the camera is unique if it is a wide angle lens. On the other hand, if you get closer to the subject, the subject is larger and the background is more widely imprinted, creating a dynamic composition. In general, wide-angle lenses cause image quality degradation at the periphery of the image, but "GR LENS A 12 28 mm" clears its concern with the highest-priority design concept of image quality. A camera unit suitable also for regular use. High resolution up to the corners of the image, high contrast The optical system is a newly developed 6-group 9-panel configuration. By adopting a special low dispersion lens in addition to two aspheric lenses, various aberrations are effectively corrected. Reduction of phenomena that are common in wide-angle lenses such as reduction in resolution and contrast at the periphery of the image, flow of image, realizing a good depiction in the entire image. Furthermore, by adopting a floating mechanism, excellent depiction power is secured at all focal lengths. Adopted a large CMOS sensor of 23.6 × 15.7 mm. With the clear size of the APS-C, it is possible to draw out the full optical performance of GR LENS. Moreover, the range of expression widens, such as blurring the background by taking advantage of the large aperture of the opening F 2.5. In addition, it incorporates GR ENGINE III as an image processing engine. High speed / high precision AF It supports CMOS sensor at high speed, and also adopts new drive mode, and quickly realizes a spright AF. Also, it is possible to set the AF area at the time of spot AF to [pinpoint]. The AF area frame becomes smaller than usual, and it is possible to focus strictly on a target point. Continuous shooting ability and HD movie function enabling a variety of expressions Even when image size [RAW] is selected, light continuous shooting of up to 4 images (noise reduction [OFF] [weak]) is possible. In addition, you can shoot HD movies up to 1280 × 720 (aspect ratio 16: 9, frame rate 24 frames / sec). Manual focus ring that enables delicate focus adjustment Equipped with manual focus ring. After AF, it is possible to fine-tune the focus seamlessly. Even when you want to take close-ups to the subject, take advantage of the beautiful blur tone of Open F 2.5, even if you want to shoot, the focus is comfortable and speedy. Noise reduction function that leaves high sensitivity shooting beautiful Even if the ISO sensitivity is set to be high, the image quality is high, so a beautiful picture can be obtained even when shooting indoors or night scenes. Production of light and shadow. Use external TTL Flash GF-1 Unique TTL dimming is possible to obtain highly accurate dimming exposure by preliminary light emission. Effective for prevention of camera shake Use cable switch CA-1 It is useful for long-time exposure when using a tripod, such as night scenes and macro shooting, and in scenes where camera shake easily occurs. Pictures sticking to the AE / AF target function composition, as expected AE (exposure) / AF (focus) Both, or any target point can be moved to any position on the screen. Focal length (wide angle side). F value (wide angle side). A : 3 - 7days To Europe : 3 - 7days To Asia : 2 - 7days To Others : 3 - 14days. It might get delay due to weather condition or by some other reason. All of my item is genuine item, I never sell any kind of third party item. International Buyers - Please Note. We will find any item for you. The item "RICOH Camera unit for GXR GR LENS A12 28mm F2.5 170560 genuine from JAPAN NEW" is in sale since Friday, October 26, 2018. This item is in the category "Cameras & Photo\Digital Cameras". The seller is "japan_atmarket" and is located in Japan. This item can be shipped worldwide.